You have a Honeybee Swarm who are you going to call? Please use the BBKA Website for local swarm collectors. The general public should contact our volunteer swarm collectors on the list. You will be asked to supply the exact location of the swarm. 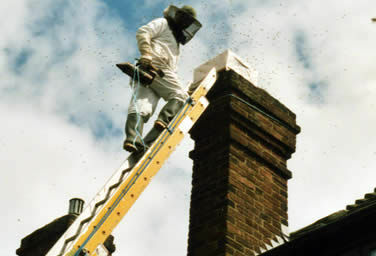 Most beekeepers would make a charge for removal of a swarm from your garden depending on travelling distances to cover costs of petrol etc (details of individual charges are beyond the scope of this web page). Note: Swarm coordinators are often inundated with calls about Bumble Bees but there is nothing a beekeeper can do. It’s well worth reading our FAQs and our latest article Tree Bumble Explosion for help and advice. I currently have a swarm of honey bees in a tree that I have begun to cut down. The bottom half of the tree has been left as this is where they are currently living. They are not currently an issue but if they are of interest to a local bee keeper please feel free to contact me. I am located in Hoo, Rochester. Have swarm of honey bees in a busy place near a park in Biggin Hill that need removing please. The KBKA is a member association of the BBKA, so KBKA swarm collectors are listed there along with swarm collectors from neighbouring associations. Kent Bee-Keepers’ Association (KBKA) bye-laws and regulations –Revised 23th September 2017.